When you open Scratch, the user interface has several panes, buttons, and icons rather than text. 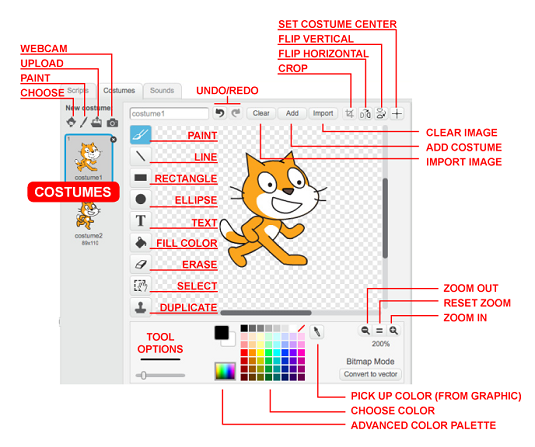 Knowing how to use the main interface, including the Bitmap and Vector Paint Editors, the Sound Editor, and Scratch’s coding blocks and scripts, can help you design Scratch projects in no time. 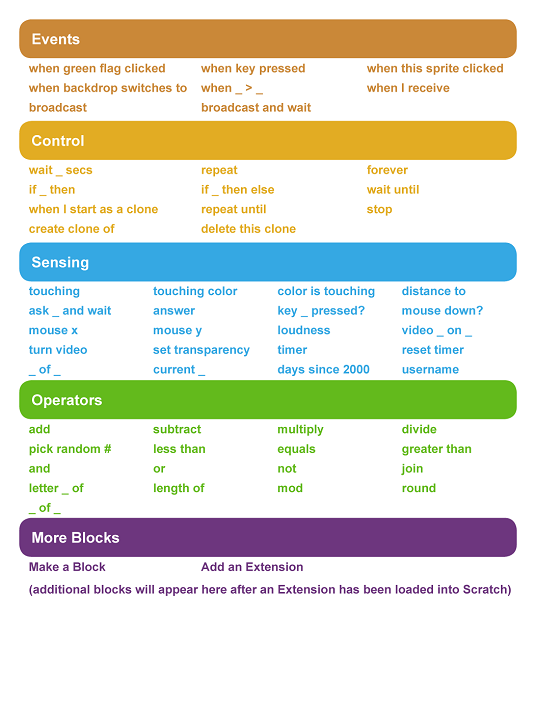 The Scratch user interface divides the development environment into several panes. On the left of the screen are the Stage and the Sprites areas. In the middle of the screen are the coding blocks. When selected, the Scripts area, Costumes Editor, and Sounds Editor appear on the right. The Scratch Bitmap Paint Editor allows users to create sprites, costumes, and backdrops with the bitmap tools and techniques in Bitmap Mode. The Bitmap Paint Editor is the default editor when creating a new sprite, costume, or backdrop. By clicking the Convert to Vector button, users can design sprites, costumes, and backdrops with the vector editing tools and techniques in Vector Mode. The Scratch Vector Paint Editor allows users to create sprites, costumes, and backdrops with the vector tools and techniques in Vector Mode. Vector graphics allow users to design various parts of an image separately, resize parts of an image, and increase the image size without the image becoming blurry or pixelated. 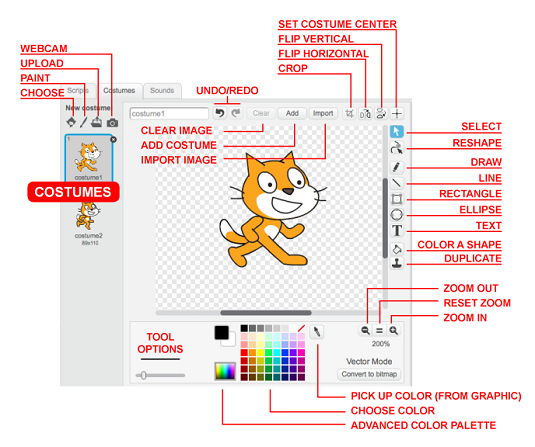 To design sprites, costumes, and backdrops using the vector editing tools and techniques, a Scratch user must click the Convert to Vector button to enter Vector Mode. 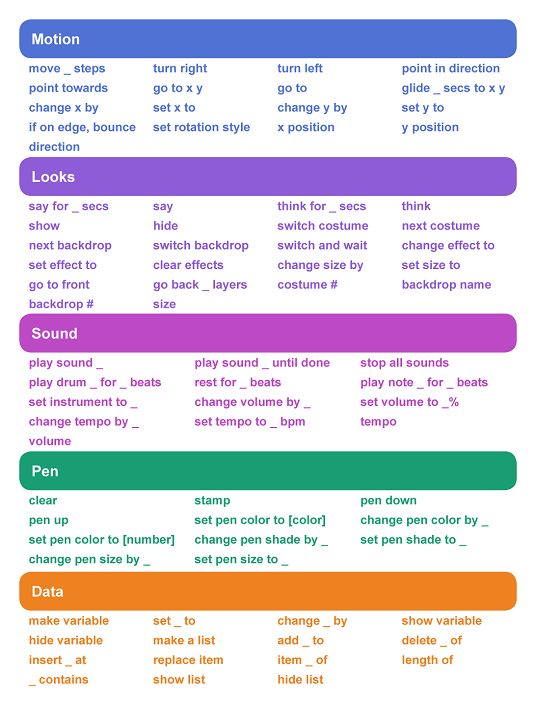 The Scratch Sounds Editor allows users to record and edit sounds to use within a Scratch project. By using visual waveforms, The Sounds Editor makes precisely trimming the beginning and ending of audio clips easy. Users can also use the Effects menu to change the volume, fade in or out, and reverse the audio. 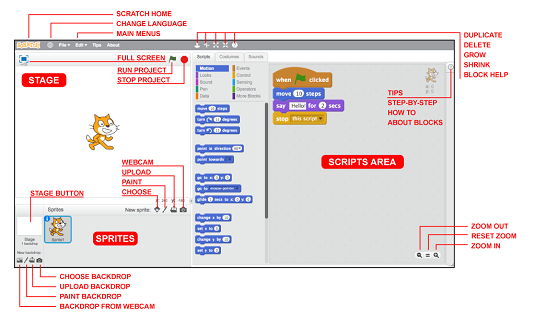 Scratch blocks are puzzle-piece shapes used to create code in Scratch. Each type has its own shape and a similarly shaped slot for it to be inserted into. A series of connected blocks is called a script. The blocks are grouped into categories and color-coded to make them easier to find and identify.